Written by George Bernard Shaw; directed by Daniel Sullivan. Opened April 25, 2018, closes June 10, 2018. Reviewed by Lucy Komisar May 2, 2018. 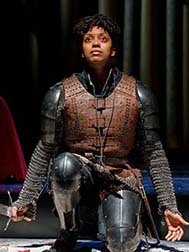 This Saint Joan (Condola Rashad) is a charmer. At the same time, she is no farm wench but a tough young woman of 17. She hears voices. She vows to make English occupiers leave France. As she is in soldier’s dress at the Siege of Orleans, men put her down. In Daniel Sullivan’s feminist take, the men are fools, bickering jerks. Especially the Dauphin (Adam Chanler-Berat), who is feuding with the Archbishop of Rheims, (the excellent (John Glover). But then, playwright Bernard Shaw was a feminist, too. And a religious skeptic. Who better than to tell this story. 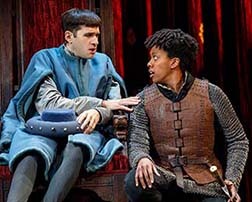 Adam Chanler-Berat as the Dauphin and Condola Rashad as Joan. Photo by Joan Marcus. But how to you do that when a socialist is not a militarist? You focus on the hypocrisy of the religious establishment, that had no problem with war, but only with who keeps power. As Rashad plays her, Joan is aggressive, persuasive. She knows to kneel before the Archbishop. She knows to play the Church. To a point. She is attached to the soil, but not as a serf. 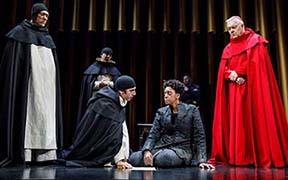 Condola Rashad as Joan and the clergy, with John Glover as the Archbishop of Rheims. Photo by Joan Marcus. And, by the way, the churchmen couldn’t care less about France. They just hope she’s not a heretic, whatever that means. And discuss how to save her soul without saving her body. Even worse! Joan wants to take Paris from the occupiers. The problem in the play is that Rashad doesn’t have magnetism. We never do learn how she got the soldiers to follow her. Still I loved her besting the crude, crummy clericals and royals!